Martinsburg City Hall is located at 232 North Queen Street, Martinsburg, WV 25401; phone: 304-264-2131. Photo: Henry McCauley Farm, ca. 1830/1850, Ditto Farm Regional Park, Mount Aetna Road, near Hagerstown, MD. Listed on the National Register of Historic Places in 1976. Photographed by User:Acroterion (own work), 2013, [cc-by-3.0 (creativecommons.org/licenses/by/3.0)], via Wikimedia Commons, accessed February, 2014. Martinsburg was never a rural town. It was laid out by Major Adam Stephen as a colonial village for the purpose of being the county seat. Norborne Parish was created by the English Church in 1771. In 1772 that area was carved off from Frederick County, Virginia, and established as the County of Berkeley, Virginia. 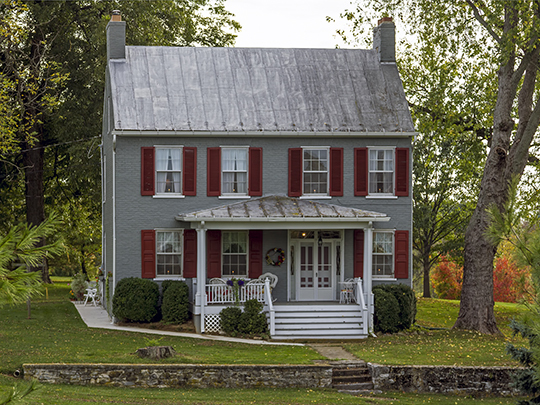 Meetings of the court were held in the Red House for a short time, however, they were soon moved to Adam Stephen's house at Liberty Spring, within the present day Martinsburg. Adam Stephen offered land and stone to build a courthouse and jail. A dispute soon arose between Adam Stephen and Jacob Hite over the establishing of a town for the county seat. Lord Fairfax had established the first known town in Berkeley around 1745 on his Maidenstone Manor and near Watkins Ferry. This was a small town which never grew and died shortly after the founding of Martinsburg. Shepherdstown, in early days known as Mechlenburg, was founded in 1762 and is the first incorporated town in West Virginia. It was settled by German-speaking Pennsylvania Dutch families who migrated to that section in the 1750s. These were late comers to the area where early settlers were English-speaking Quakers and Presbyterians. This made a big difference in the town chosen for a county seat. Adam Stephen had acquired land from Lord Fairfax's property of the Northern Neck which took in the Berkeley area. Berkeley County was named for Norborne Berkeley and Adam Stephen named Martinsburg after Fairfax's nephew, Denny Martin. By 1775 Adam Stephen was selling lots in his town. Lot one in the town square had been reserved for the courthouse and jail. Tradition has it that after the selection of Martinsburg, Jacob Hite who lived in the area that later became Leetown, was enraged over the selection of Adam Stephen's Martinsburg as a county seat and moved to the Carolinas where he and most of his family were massacred by Indians. Though the Revolutionary War broke out just at the time of the development of Martinsburg, its growth continued. By April 1778 the town had been laid out on 130 acres with 269 lots. Martinsburg was an industrial town from its very beginning. It was bounded on the north and east by Tuscarora Creek. Adam Stephen was an early industrialist, establishing a grist mill, an oil mill and a new wooden mill just before his death in 1791. Several taverns were established along Tuscarora Creek. Tax Records of 1790 showed 120 lots having been sold. A substantial county jail was built of stone a few years later. Martinsburg was incorporated as a town in October of 1778 by the General Assembly of Virginia. A few Baltimore, Philadelphia and Chicago merchants purchased lots in the town and established businesses. Along with them came the establishment of religious meeting houses of various denominations. A large brick hotel, the Globe Tavern, was built in 1790. It served as a town meeting place. By 1870 several small villages had been established — Bucklestown (Darksville), Gerrardtown, Hedgesville and Bunker Hill. In 1842 the B & O railroad came to town and spurred additional growth. Large hotels and sprawling warehouses were erected. A new courthouse was built in 1856. The railroad set up an engine house and machine shops in 1849. During the Civil War occupation by Union and Confederate troops changed back and forth many times. By 1866, Reconstruction was underway restoring much of what had been destroyed during the War. A waterworks was established in 1873. Distilleries and mills were created. A second railroad (the Martinsburg and Potomac) came to town in 1873 resulting in the establishment of more new businesses. Electricity came to Martinsburg in 1842. Downtown Martinsburg Historic District, National Register of Historic Places, National Park Service, nomination document, 1980, #80004416, www.wvculture.org, accessed October, 2012.